Final round of UK Championship Qualifiers here we are! The matches today will determine who will book their places in York. 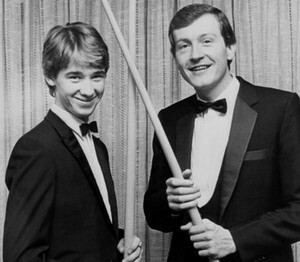 Davis added: "When I first dropped into the qualifiers, I just got stuck in and didn't say 'I'm not supposed to be here' - and I think Stephen (Hendry) will be the same. He's got nothing to worry about as long as he's optimistic and get's his attitude right. He's bound to win some and lose some." Davis is right but Hendry came through from his pressure. Hendry was 2-0 up on Gerard Greene before Greene levels 2-2. Somewhat Hendry struggled but had his head back to win 6-2. "Playing in the qualifiers is a different kind of pressure for me, but my position in the rankings is self-inflicted and that's why I'm here. I'm not used to it and I want to get back into the top 16 as soon as possible. I just tried to concentrate on the match today and put in as much effort as I could." Hendry will face his fellow Scottish Stephen Maguire in the first round which he expected to be a tough one - Their last meeting was Welsh Open in February which Hendry made his tenth 147 but losing 2-4. Marco Fu won a thriller against Anthony Hamilton which he described it as one of the most thrilling and big victories in his career. Fu lost his first three frames but he managed to recover to lead 4-3. Hamilton took the next two frames to lead 5-4 but Fu did not give up to force a decider. In the final frame, Hamilton leads Fu 55-5 with a foul but Fu cleared to win on the final black with 54. The Hong Kong man clenched for his win. Fu will play Bingham at the venue. 19-year-old young Chinese Li Yan qualified for UK by winning four matches in a row, including an impressive 6-2 win over Fergal O'Brien in the final round. This will be his first time to qualify for a ranking event, in his first professional season on the circuit. Li is going to play Shaun Murphy, winner of the event back in 2008. Peter Lines cameback to beat Ken Doherty 6-5 from 3-5 down.